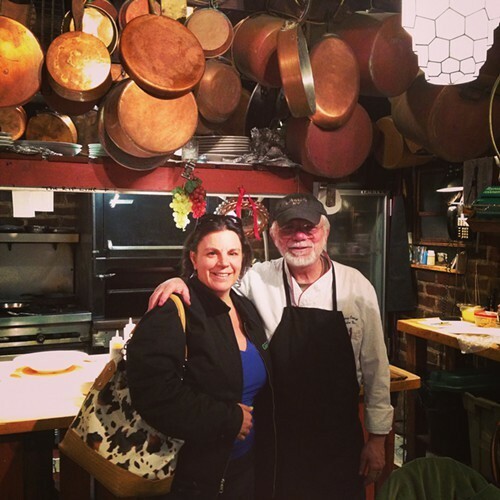 Depuy Canal House in High Falls, NY has been on my list of Hudson Valley restaurants to visit for a long time so I was delighted when Chef John Novi invited my husband and I for dinner a few Friday nights ago. Our reservation was for 6:30pm and when we arrived, I instantly felt at home. 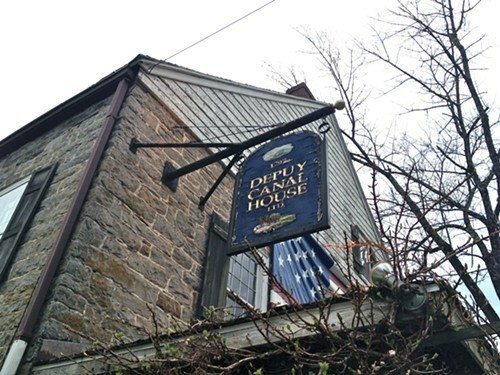 The Depuy Canal House stone house building originally opened as a tavern in 1797. The beautiful place settings with china, creeky floors, and coziness reminded me of being in my uncle’s stone house on a farm in the Loire Valley of France. I’ve been trying to eat more vegetables lately so it was nice to see a few dishes that highlighted vegetables on the menu. Depuy Canal House is known for their tasting plates, and our first tasting plate had a salami cone with an almond and hummus, and pate. 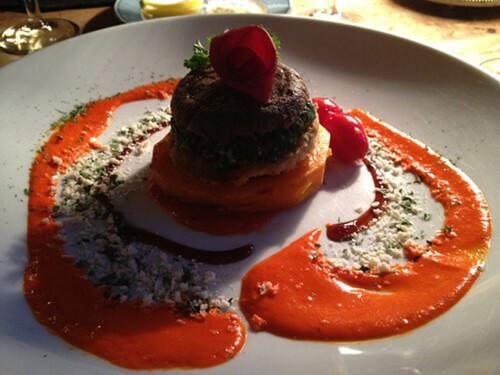 Next, another tasting plate arrived (cauliflower frittata, heart shaped daikon, and red pepper stuffed with spinach). The roasted pepper was roasted just right and somehow melded with the spinach. Chef John Novi, has a way with vegetables. For my appetizer I had the Arugula and Napa salad. This was no ordinary salad. Part of it was served in a rice paper bowl, which was very soft and chewy, and complemented the citrus dressing well. The roasted beet and cippolini onion made it a very hearty salad. Tom had the Reel of Carrot pasta with ricotta cheese and bolognese sauce for his appetizer. Tom loved it though he kept on saying that it wasn’t really pasta because he said it tasted like tender carrots and the delicious bolognese sauce. (I was so into my salad that I forgot to taste his dish to understand what he meant). For my entree I ordered the Vegetarian Tower (butternut squash, duxell eggplant, spinach, and mushroom caramelized onion with rhubarb and mirin sauce). As you can see the presentation was beautiful. 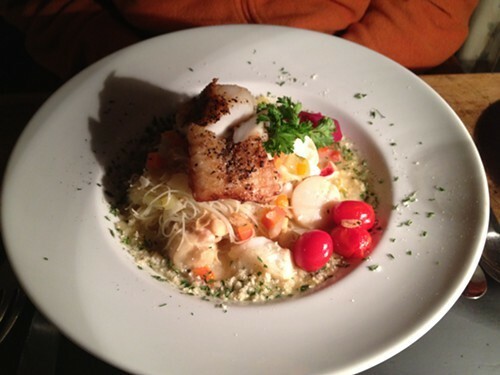 Tom decided on the Bouillabaise with Thai Tom broth and scrod saute. It was so good, and I was delighted that Tom shared one of those scallops with me. We finished every morsel! 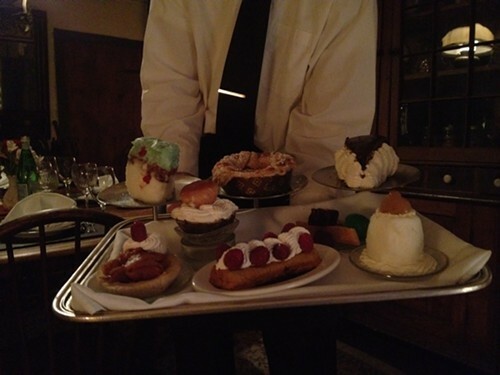 When our server Chris came over with the dessert tray, I had a tough time deciding because everything looked good. 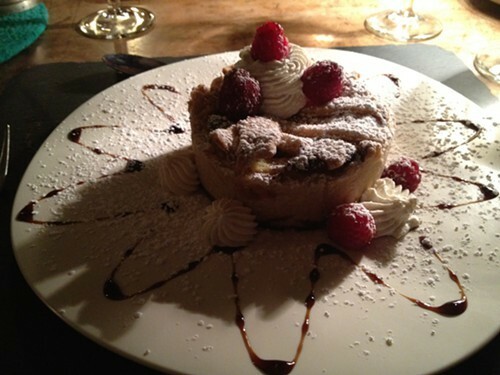 I left it up to my husband who picked the Italian cheesecake, which comes from a secret family recipe. After dessert and coffee, we thanked the chef who was busy in the kitchen, and saw a small group of friends sitting at the beautiful table in the large kitchen, with Chef Novi creating his master pieces on the stove nearby. (Note: Groups of up to 12 can dine in the kitchen, but since this is getting to be more popular Chef Novi advises that you reserve two weeks in advance if you want to dine in the kitchen. If there happen to be no reservations for the kitchen table the night you dine, you may be able to dine in the kitchen). 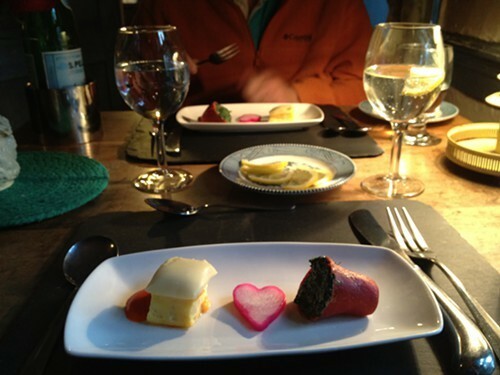 I’d definitely recommend Depuy Canal House restaurant if you are looking for a romantic dinner or a place to have dinner in a chef’s kitchen. I didn’t take a photo of the four friends dining in Chef Novi’s kitchen, but they all looked very excited and happy to be there. Wish he could cook in my kitchen. My kids might actually enjoy eating vegetables if he did! Find out where to eat, play, and recharge your spirit at Hudson Valley Good Stuff, Vanessa Ahern's blog.